Airstream Durability: How Long Do They Last? We all want to know how long our RV’s are going to last, and the Airstream’s durability is no exception. These iconic travel trailers have been popular since their introduction, but we want to know why. How long does an Airstream last? Airstreams can last for 40 years or longer if properly taken care of. Their aluminum body is the key feature that makes it lightweight, aerodynamic, and durable to the elements. The aluminum increases the price but also the quality and longevity. While all trailers have durability issues over time from the nature of their use, Airstreams are among the most dependable. Saying it’s so is just the start, continue reading to understand what your money is buying you. We all want our RVs to last a long time whether they’re an integral part of our daily lives or our vacation days. You want to invest your money and time into a machine you can count on. The Airstream has been the epitome of this dependability for decades. Their website chalks the success up to quality work rather than simple and fast solutions. According to another Airstream website, they can last for 40 years and beyond! Their statistics show that 70% of all Airstreams that have ever been manufactured are still being used today. This is a statistic that compares to other RVs lasting approximately 15-20 years. The same website also boast a “20% better fuel economy“ in comparison to other travel trailers. These are the kind of things customers want to know before choosing what, where, and who to buy from. How they’re made is the major point of focus when trying to discover the source of their durability. The aluminum body is shaped to optimum aerodynamics and is significantly less likely to leak than conventional trailers. The body accounts for the strength and price of the trailer. The more expensive materials allow for a higher price for customers. This definitely seems like a downfall when you’re the customer (and most of you are); however, the higher price is helping to guarantee you a long lasting and good quality purchase. In the end, you have to decide what factors of buying an RV are most important. A lot of the time it comes down to quality OR cost. It’s very rarely “AND”. Airstream’s low center of gravity and independent torsion axles gives you incredible control. The less stress on the RV itself will help to keep it in good shape and make the traveling part less stressful for you. Airstream designers had durability in mind when they created the brand. Just because the Airstream seems to be the king of longevity doesn’t mean it’s the right RV for you. In the next sections, I explore all the reasons that Airstreams are top in durability so you can make up your own mind about whether it’s the RV for you or not. Airstream guarantees quality performance and durability from their trailers because they handcraft each and every one of them. Every single Airstream is crafted by hand in Jackson Center, Ohio, USA. This is probably another reason why their prices are a bit higher. The website claims that every trailer takes 350 hours to complete from start to finish. They compare this to the approximately 50 hours that it takes to make a white box trailer. They have a simple, sleek look that is timeless. Some say that they’re a luxury brand that is tailored for the more wealthy rather than the casual trailer owner. This may seem true because of the high prices, but many people find used Airstreams that they fix up at a low cost. The durability is still intact even though they didn’t end up paying top dollar. Airstreams have been specifically created to cut through the wind on a road trip. The people of Airstream have thought through most issues facing an RV traveler. If you want the technical breakdown of what they do, here’s a snippet from their website. You don’t want travel and transfer of your trailer to put a damper on your adventurous spirit. Airstream has tried to design their trailers in such a way that road travel isn’t a stressful mess. They have minimized the hassle of towing and have tried to create as much uniformity between your towing vehicle and the home on wheels being towed. What traveler doesn’t want that? Another reason these facts are so prevalent in our discussion about the Airstream is that the low center of gravity and stabilizing features make it safer on the roads. There’s less movements and vibrations, which minimizes the risk. The major analysis given to Airstreams include that they are one of the most dependable brands but the highest priced. These are the trade-offs of most things. If something is high quality then that means that you are having to pay top dollar. Higher quality materials are naturally more expensive because they are desired by the consumers. On the flip side, this also means that if you buy a trailer for cheap then the thing itself is probably less reliable and, forgive me, cheap. It isn’t a bad thing to have a low cost and low-quality trailer because not everyone uses them the same way. One person may dream of life on the road and would need a high-quality trailer that will last and be dependable. For those who like to vacation or camp in a trailer occasionally, the highest quality may not be in your best interest. The lower cost trailers are not dumps. They have the features and reliability to get the job done. They just won’t last you 40 years. These are the things you have to give careful thought to when picking out your RV. What’s in YOUR best interest. It may not be a decked out Airstream trailer. This is why your research is so vitally important: no one person is the same. Airstream delivers on quality and can be just the thing you’re looking for. Airstream claims that their trailers are 20% more fuel efficient and have lower maintenance costs than other brands. You also hear that the resale value of the Airstreams are close to what you paid for it in the beginning. This is good news for someone who doesn’t plan on owning an RV for the next 30 or so years. This definitely sounds like I’m out selling Airstream trailers door to door. Don’t worry, I’m just trying to provide you with all of the facts pertaining to Airstreams and their dependability/durability. Here is a comparison of 4 Airstream travel trailers varying in size and price. This table shows the wide variety of travel trailers that Airstream has to offer. They seem to have the right sized trailer for any family or single adventurer. Here is another table comparing the “Tommy Bahama” to other trailers of the same length and types of features. As you can see from the rough break down I have provided, Airstream has a significant lead in the price department. This isn’t a fully fair comparison due to the lack of amenity data I have acquired. Some websites don’t advertise base prices until you request a quote and choose all your options. If you wish to pick and choose your amenities and add-ons then other companies may be just what you need! If you want quality interiors with all the bells and whistles then Airstream has your back. Their website lists all their features and ways to personalize your trailer. Airstream seems to be a lifestyle instead of a last minute purchase decision. Like any big purchase you make, you want it to be worth the money. This isn’t an arbitrary thing. You can actively and smartly work to make it worth the dollars you spent. The more you plan to use it, the better you’ll feel about the price. The more you use it, the more you’ll realize how good the quality actually is. It’s not a passive game to play. If you want it to be worth your time, effort, and money, you have to use it! This is a company that delivers and isn’t meant to be used on special occasions every few years. It loses its personal value by that time. This is all up to personal opinion, of course, so I can spout ideas until I’m blue in the face without having any real effect. All in all, the price is a bit high, but you’re getting the durability and longevity you’re paying for. The prices I’ve been using for Airstream above are for new ones. There are plenty of used Airstreams on the market that may be closer to your budget. They are still higher priced because of the durability; however, if you find one old enough, you can get a good price without sacrificing that key component that makes them so desired. There is an Airstream on eBay right now going for approximately $15,000, so there is wiggle room if you’re not looking for a completely new model. Thanks to the internet we can shop and find and save all without leaving our house. You are sure to find the best price for you on your Airstream if you catch the right break. As opposed to what you can see from the prices offered in the tables above, there is much more to a travel trailer than what you may think. Airstream promises quality and their customers agree that they deliver. This isn’t a long-winded section about how terrible Airstreams are because customers are generally pleased with their purchases. They’re not jazzed about the price, but they think other factors far outweigh what it costs. Essentially, they believe they are getting what they paid for. The complaints come along with the durability factor and overall cosmetics. The sleek aluminum exterior only stays pristine for so long. The trailer is prone to minor dents from rocks or other hazards on the road. These hazards never do more than scratch it up and put small dents into the body. This is a hazard of having a trailer. They come with you on adventures that have you crossing states, climbing up mountains, and bouncing down dirt roads. You need to be okay with it getting a little worn as the years go by. The actual appearance of these scratches doesn’t do anything to dim the quality of the trailer. The dents don’t affect the inside or how it runs (unless a boulder falls from the sky and smashes it to bits, which is highly unlikely). Another complaint may be that their older models weren’t as well insulated as one would hope. This is the reoccuring trial with any trailer because of how lightweight and movable they are designed to be. They weren’t meant to sit in one place, still and immovable forever: they keep travel in mind. Therefore, they don’t have the type of insulation a house might. Another thing that can be a subject of a complaint from people is that they aren’t as versatile in space as other RVs. What I mean is that there aren’t pop-out sections or hidden compartments that will roll out giving you more space. What you see is what you get. 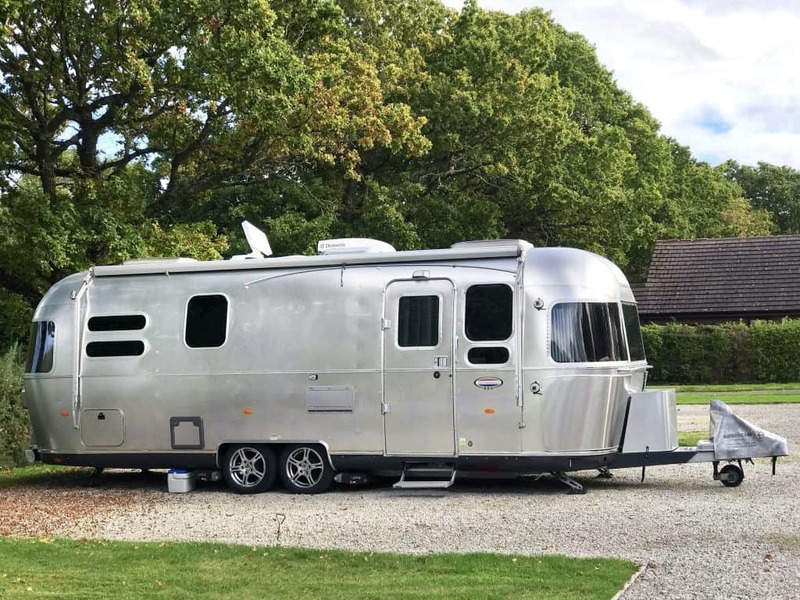 There are plenty of creative ways to make the space work for you, but some people find that they need to live a slightly simpler life to live or travel in an Airstream. The size restrictions aren’t significant enough to cause worry for buyers, but some people find that to be a deal breaker. These trailers are used and reused. Most people aren’t afraid to buy them used because they have such a long history of durability. These reliable vehicles are popularly sold and then renovated to fit many different needs. People will spend a lot of time taking a beaten up Airstream and renovating it back to its former glory. The body of these used and sold Airstreams are usually always up to more years of adventure and durability. This is why they’re covetted. Renovating an old one can also give you creative liberties to add more space, pick a layout specifically concocted by you, and add anything else you think you may want. Total creative freedom can seem daunting, but a lot of people find it freeing and cost effective! There are tons of used Airstreams being sold. If you want to take on a project with a really durable body, then this may be the path for you. Airstreams are known for their durability and have proven that they last a long time even when reused over and over again. What you need to decide now is if you’re ready to buy new, buy used, or buy something else. Your needs, wants, and budget are the only things that matter in your search for the perfect RV. Weigh your options and compare them against your requirements. I know you’ll make the right choice! Who owns Airstream Company? Thor Industries is the company that acquired Airstream in the 1980s. Thor Industries was founded by Wade Thompson and Peter Orthwein who were the men to actually buy Airstream. They also own Jayco and Livin Lite RV. How much will Airstream Nest cost? The Airstream Nest is going to cost around $46,000. This is a lower cost than most of the other travel trailers by Airstream are sold at. The Nest is a new modern version of the original design that made Airstream famous. This trailer was released in April of 2018. Can Airstreams Be Used in Winter?